Newborns can have books too! 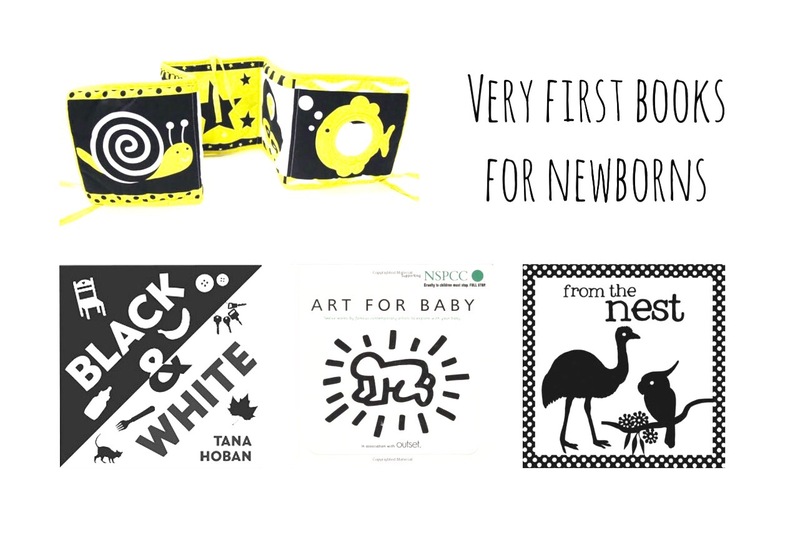 You can start the book habit by exploring high contrast books with your newborn pretty much straight away. Black and white (and sometimes yellow) books have been one of my favourite presents for new babies for a few years now. Babies can only see these types of high contrast images initially, so black and white pictures are perfect for engaging their interest in the early days. Black & White by Tana Hoban is a board book which opens up like a concertina of single images and can be propped up for baby to view. 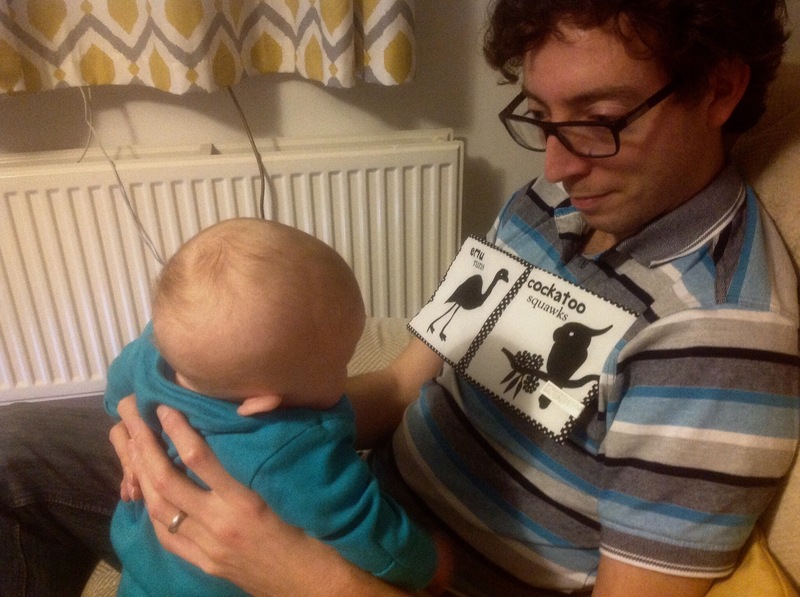 It folds up so you can also use it as a traditional board book for when the baby’s older or whilst out and about. I’d recommend this highly as the best of the many black and white board books available. 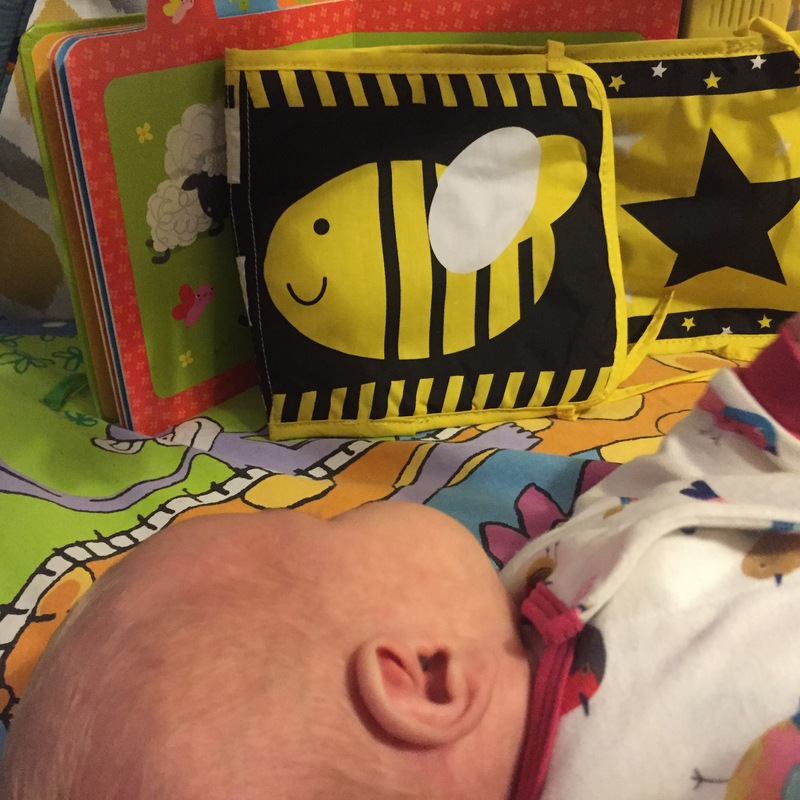 We started using both of these two fold out books almost from birth, propped up round the playmat. Felicity was examining the pictures intently from a few weeks old, clearly preferring some images to others by staring at them for a lot longer. I found it incredible she was showing such an interest when she couldn’t even smile at this stage. Will was mainly excited that, as an obsessive insect fan, her favourite pictures were of a butterfly and a bee! Art for Baby: High-Contrast Images by Eleven Contemporary Artists to Explore with Your Child, is a more traditional big hardback book. Felicity definitely engaged with this but due to its size we’re starting to look at this more now she’s a bit bigger – it’s a bit tricky to get a newborn to sit and look at a big book. It will be interesting to see if she still responds to the pictures when she’s older or whether the lack of colour will put her off. Our copy arrived after I’d decorated the nursery but it came with a collection of prints of the artworks which would be a lovely (and cost effective) way to bring some modern art to a nursery. Crinkly Book Of Aussie Animals: From The Nest by Jill Brailsford. This was a gift, brought all the way back from Australia. It’s a collection of illustrations of Australian birds with a few descriptive words alongside each one. I haven’t been able to find anything like this in the UK which is a shame as it is fantastic! I included it anyway as it’s such a good example of a first book. It’s made of that wonderful crinkly fabric babies just love and is small enough that it was one of the first things Felicity could hold. The fabric also makes it perfect to put on your chest do you can see how the baby is responding to it. It’s a perfect bridge between the fold out style newborn books and more traditional colourful picture and board books. The illustrations are lovely too! Please someone make something this good for the UK (and lucky you if you’re in Australia). I am definitely going to continue giving these books as newborn gifts as they are such a lovely way to start sharing books with your brand new baby. It’s also one of the first ways you can really see baby responding to something external, which is a lovely gift to be able to give any parent. I’d also really recommend parents-to-be investing in a few of these books, the examples I’ve given are the tip of the iceberg of what’s available. A lot are under five pounds as well, which, as any expecting parent can confirm, is a bargain compared to the cost of a lot of other ‘must have’ baby paraphernalia. Happy high contrast book sharing!